Ignore the snazzy green Elevation dock. Points in its favor: the buttons are big. There’s a light at the top that blinks when it receives input, so you know that it got the message. Points against: why - and this is my big quibble with the damned thing - why are the buttons in a circular ring? Without looking, which one’ll turn off the fan completely? Which one’ll set it to medium? I’ve lived with this fan for four years, and I still can’t tell you. I have to read the buttons to figure out which one to press. Every. Single. Time. Why aren’t they in a big stack, with “fast” at the top and “off” at the bottom? There’s even a light button - have the fan speed buttons get wider as it gets faster, and have the light at the top! Maybe even shape it like a stupid lightbulb! This remote is my design nemesis. It irks me. It’s irksome. Minor update: The lovely people from Fracture agreed with me on Twitter! They also brought up a point that I meant to mention on here, that the buttons are laid out to mimic the appearance of a fan. Because they reminded me, they get complete credit. 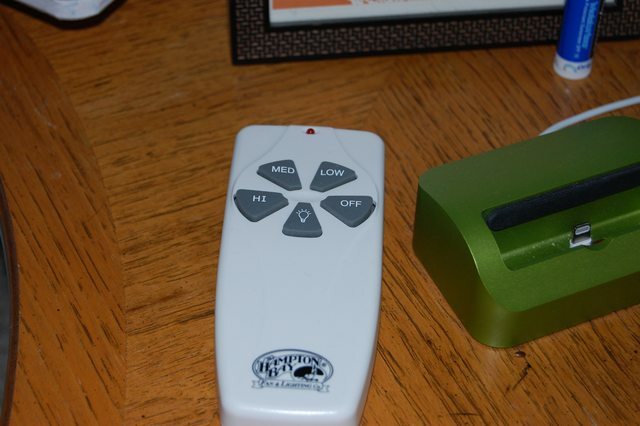 The remote is absolutely supposed to look like the spinning blades of a fan. It’s the only thing that’d make any sense - it’s neat from a skeuomorphic perspective, but pretty awful usability. I make stuff, because I go crazy if I don't, and I do my best to make cool stuff, for the same reason.